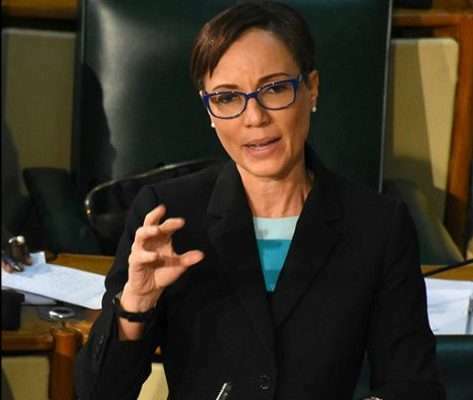 Foreign Affairs Minister, Kamina Johnson Smith, says all of Jamaica should be concerned about the declaration by Opposition Spokespersons, Phillip Paulwell and Lisa Hanna, that the PNP will oppose the Government’s push to unilaterally take control of Venezuela’s stake in Petrojam in a bid to protect Jamaica’s energy security. Both Mr Paulwell and Ms Hanna have blasted the Government of Jamaica for what they argue is a posture that’s both hostile and ungrateful to Venezuela. The Foreign Affairs Minister appeared on Cliff Hughes Online today and expressed her disappointment with the stance taken by Mr. Paulwell, Ms. Hanna and the PNP. Minister Johnson Smith says she’s not confused about who’s interest she’s been appointed to serve. But, she says it appears that Mr. Paulwell and Ms. Hanna cannot appreciate that it’s necessary for stakeholders in Jamaica to protect the nation’s economic interest. Asked what she thought was motivating the Opposition’s posture on the stand-off between Jamaica and Venezuela, this is what the Foreign Affairs Minister had to say. In the meantime, Mrs. Johnson Smith says the criticism from Mr. Paulwell about the Government of Jamaica’s decision to compulsorily retake Venezuela’s shares in Petrojam is unconscionable. Minister Johnson Smith says it appears Mr. Paulwell has conveniently forgotten that approximately 14-years ago he told parliament that the upgrade of the Petrojam refinery is urgent and Venezuela had agreed to assist with the initiative. That assistance has not been forthcoming. Minister Johnson Smith says a review of all Jamaican overseas missions is taking place. The review includes the delegation based in Venezuela.